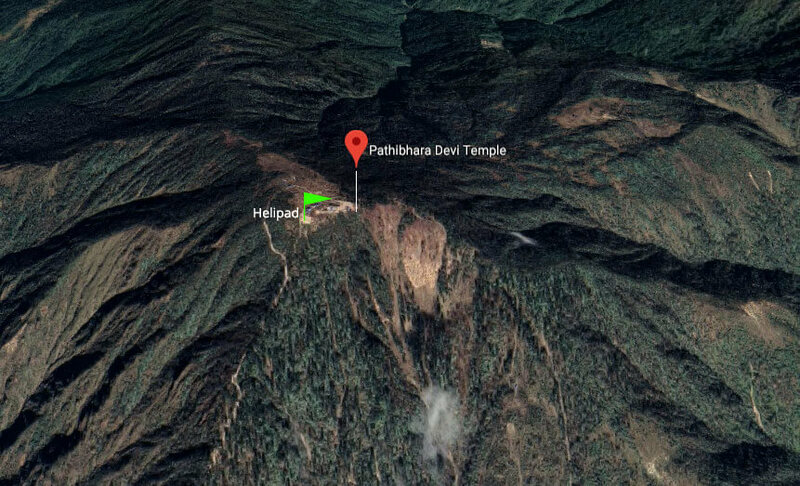 Pathivara Darshan by Helicopter ride is the easiest way to visit the holy temple of Goddess Pathibhara Devi in eastern Nepal. The helicopter flight offers scenic mountain views of eastern Nepal including the world’s third highest mountain Kanchenjunga in Kumbhakarna Himalayan range. Pathivara Devi temple tour by helicopter ride in eastern Nepal is one of the most popular Hindu temple visiting package. The temple of Pathivara devi is located on the hill of Taplejung district is consider as the “ShaktiPeetha”. The Hindu goddess Pathivara is the taken as the source of wealth and energy. Pathivara temple is also considered one of the holy places for Kirats. Hindus believe that a pilgrimage to the temple ensures fulfillment of the pilgrims’ desires by the goddess. The temple is located at the altitude of 3,794 m. (12,444 ft.). The pilgrims offer animal sacrifices, gold and silver to the Goddess Pathivara. The waterfall at Sawa and the pond of Timbung near the temple are the additional attraction of this tour. Pathivara heli tour program starts from Bhadarpur or Biratnagar airport to the helipad nearby the Pathibhara temple. Helicopter lands near the Pathivara temple in the walking distance of minutes. After visiting the temple, we return back to Bhadarpur or Biratnagar.